This week Augsburg students, friends, faculty, and staff members celebrate the vital role philanthropy plays in the College’s culture with multiple on- and off-campus opportunities. 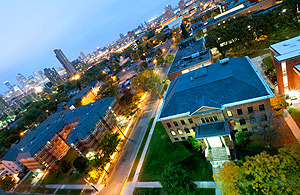 The Augsburg experience is supported by an engaged community and philanthropic initiatives make the institution’s distinct education possible. GiveMn, an online resource that helps Minnesotans donate to the state’s non-profit community, will host its annual Give to the Max Day on Thursday, November 15. Augsburg College is pleased to participate in Give to the Max Day, and a $10 donation has the possibility of turning into $1,000. Beginning at 12:01 a.m. on November 15, one donor will be selected each hour to receive a “golden ticket” worth $1,000 to donate to the non-profit of his or her choice. Augsburg College administrators, staff members, and friends will attend a National Philanthropy Day Celebration on Friday, November 16, and host representatives from The Carl and Eloise Pohlad Family Foundation, the winner of this year’s Outstanding Philanthropic Organization award. Hosted by the Association of Fundraising Professionals (AFP) Minnesota Chapter, National Philanthropy Day honors “local individuals and businesses who have demonstrated exceptional leadership, as well as generosity of time and resources, to encourage and advance philanthropy,” according to the AFP website. According to Roller, the Pohlad Family Foundation was the first foundation contributor to the Minnesota Urban Debate League (MNUDL) when that program moved to Augsburg College in 2009. 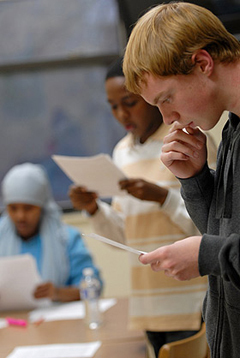 MNUDL serves young people in Minneapolis and St. Paul through academic competitive debate, and students in the program had a 100 percent on-time high school graduation rate during the past two years. More than 330 youths participate annually, of whom nearly 70 percent are students of color and approximately 75 percent are from low-income families. MNUDL is assisted by an advisory board and funded through individual donations, foundations, corporations, and the legal community. During the National Philanthropy Day Celebration, AFP will show a video on the Pohlad Family Foundation’s involvement in MNUDL and feature commentary by Amy Cram Helwich, Augsburg’s MNUDL executive director. The Augsburg College Campus Kitchen program will mark the upcoming Thanksgiving holiday with its annual Turkeypalooza meal service, made possible by a food and fund drive. 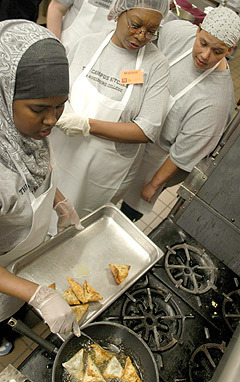 Now in its 10th year, Turkeypalooza expands Campus Kitchen’s ongoing philanthropic work in order to provide a traditional holiday dinner for the Minneapolis community. This year, donations made to the program will get a boost on Give to the Max Day from Augsburg alumna Jacquie Berglund ’87. Berglund, the founder of Finnegans Beer, will match up to a total of $1,500 in donations made to Campus Kitchen’s Turkeypalooza through Finnegans Beer and Community Fund. Campus Kitchen representatives will collect cash, frozen turkeys, potatoes, green beans, and other items from 11 a.m. to 1 p.m. at a table in the Christensen Center on Thursday and Friday, November 15 and 16. Campus Kitchen makes healthy meals accessible to residents of the Cedar-Riverside neighborhood year round. The program typically shares surplus food donated by A’viands—Augsburg’s dining services provider—with local non-profit organizations. The Turkeypalooza event is unique in that it enables Campus Kitchen to serve Thanksgiving-specific cuisine prepared from ingredients donated by Augsburg students, faculty, staff, and friends. Turkeypalooza requires huge Augsburg community participation—food and monetary donations allow Campus Kitchen to deliver and serve hundreds of Thanksgiving meals at four sites: Brian Coyle Community Center, Common Bond Communities, Ebenezer Tower, and Peace House. To learn more about Campus Kitchen volunteer opportunities or how to donate to Turkeypalooza, visit the program’s website. In addition to preparing and serving meals, Campus Kitchen manages the Augsburg Community Garden and increases access to healthy food through the West Bank farmers markets. Campus Kitchen offers Augsburg students the opportunity to engage in service learning, leadership development, and community building. AFP honored the program with its Outstanding Youth Award on National Philanthropy Day 2009.